Series note: This post and the next few in the series are the outgrowth of a presentation jointly developed with Dr. Krista M. Perreira and presented by Dr. Perreira to the October meeting of the North Carolina Governor’s Advisory Council on Hispanic/Latino Affairs. North Carolina’s Hispanic population is nearing 1 million, with 932,000 residents in 2016. The state’s Hispanic/Latino population grew from just over 75,000 in 1990 to 800,000 in 2010. Between 2010 and 2016, the U.S. Census Bureau estimates that North Carolina’s Hispanic population grew by 132,000 new residents, an increase of 16.5%, similar to the growth of this population nationwide (13.9%). Just over 1 in 4 Latino residents live in two counties: Mecklenburg (137K) or Wake (105K). The counties with the next largest Hispanic populations are Forsyth (47K), Guilford (41K), and Durham (41K) counties. In 24 North Carolina counties, there were fewer than 1,000 Hispanic residents in 2016. Statewide, 9% of North Carolina’s population is Hispanic or Latino, a much smaller share than the national average (18%). Though the Hispanic population is smaller in more rural counties, many of these counties have seen faster growth in this population over the past 25 years. As a result, Hispanic or Latino residents comprise a greater share of the population in many less populated, rural counties. In Duplin County, for example, 22% of residents are Hispanic; Sampson (19%), Lee (19%), and Montgomery (16%) counties have similarly high proportions. Most Hispanics or Latinos living in North Carolina are U.S.-born citizens (59%). 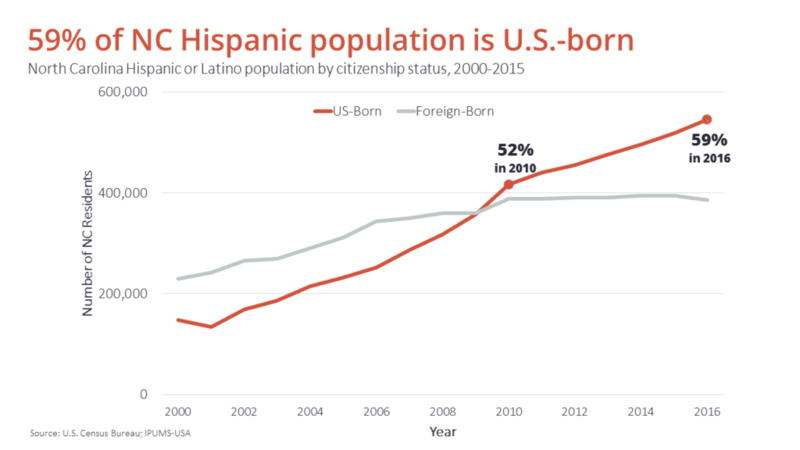 Between 2000 and 2010, there were increases in both the U.S.-born and foreign-born Hispanic populations in North Carolina, though the U.S.-born population grew more quickly. 2010 marked the first year that more than half (52%) of the state’s Latino residents were born in the United States. Since 2010, the population of foreign-born Hispanic/Latino residents has not been growing. Instead, the state’s Hispanic/Latino population has grown from births to current residents of North Carolina and from in-migration of U.S.-born Hispanic/Latino residents from other states. Both U.S.- and foreign-born Latino populations represent a diversity of cultural/ethnic origins. Among the foreign-born population, Mexico is the leading country of origin: 237,000 individuals were born in Mexico, representing 60% of the state’s foreign-born Hispanic population. The Central American countries of Honduras (36K), El Salvador (28K), and Guatemala (26K) are the next most common countries of origin; 23% of foreign-born Hispanic/Latino North Carolinians are from one of these three countries. Among all North Carolina Hispanic or Latino residents, 57% identify Mexican as their primary Hispanic/Latino background; 10% identify as Puerto Rican heritage; and another 15% are of a Central American background like Salvadoran, Honduran, and Guatemalan. 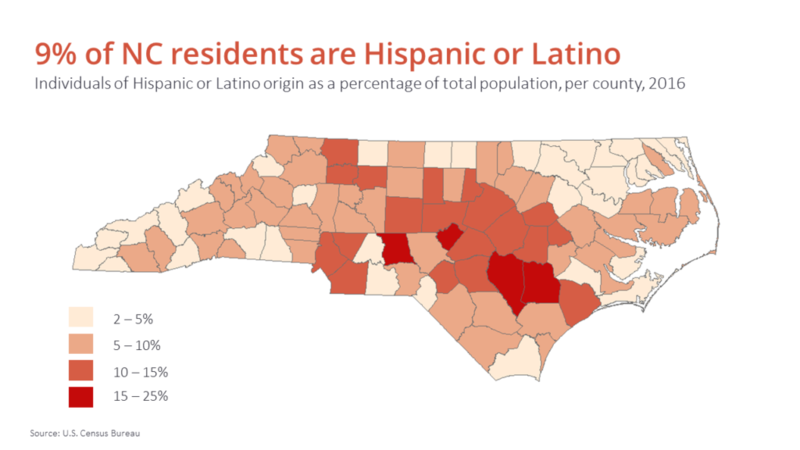 For more details on North Carolina’s Hispanic population, download this one-page data snapshot. This entry was posted in Carolina Demographics and tagged American Community Survey, Hispanic, immigration, Latino, population estimates, U.S. Census Bureau. Bookmark the permalink.